#3EIGHTHConversations was started as a little project to celebrate people who dare, and support the brewing communities of women and everyone else in between. We hope to share their stories of determination and what gives them a drive for life. After all, everyone loves an underdog; and at 3EIGHTH, we’re all about people who try, and give themselves an allowance to be. 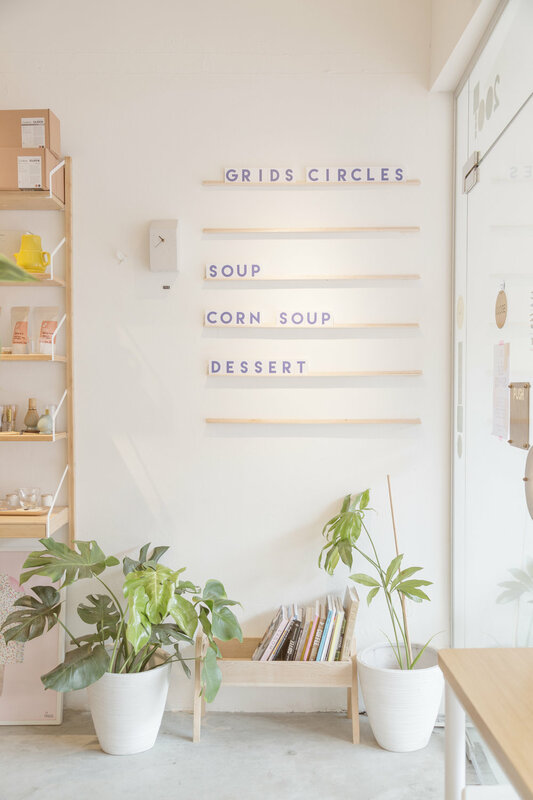 Here, we speak with Kimberly Tham, partner and owner to Grids & Circles cafè, and designer to her namesake label, Kim Tham Studios. Millennial attitudes have always been frowned upon - they are often questioned for their ever changing ideals, pursuits and goals; and that's been a constant uphill struggle as most of us try to find meaning in the work we do. Some times it doesn’t help that the new generation of people all seem too fickle as they whisk through ideas and try their hand in plenty of things before they actually take shape. It’s questionable, but when it sets them on a path; their drive seem unstoppable. A the tender age of just 26, Kimberly Tham, has dabbled her hands in plenty of creative things. From majoring in fashion design at the London Institute of Fashion, trying her hand at photography and now to dreaming up food menus; there has been a lot of self-discovery and deciding on what works for her. Today, this style chameleon and mother to a beautiful daughter is now managing the floor for her own café, and also designing for her own label on the side, and serving us what it means to adapt and grow with new-found opportunities. We take some time off and have a little cuppa to speak to Kim about her endeavours and show us around her humble café, Grids & Circles. Located right at the junction on 200 South Bridge road, it's convenient enough for those working in the CBD area but looking to take a break from the Raffles Place hustle and bustle. Their Japanese-inspired interiors are light, clean and airy looking, with a soft pastel finishing, making it perfect for brain breaks. And honestly though, I truly am a fan of their Matcha cake and also, macarons. Thanks for having us at your café Kimberly, how did you start off from launching your own design studio to now managing Grids and Circles? Kimberly: I grew up with a love for fashion, and started learning sewing at community centres before I decided to embark on a degree in Fashion while in London. It was extremely challenging because I get to push myself creatively and try out new things. Coming back to Singapore though, I was bouncing around from one freelance job to another and trying out all sorts of things to figure out what works, then I decided to try working on a bridal collection under my own namesake label (Kim Tham Studios), which pushed me to my limits. I really wanted to add a bit of rawness to the dresses so more alternative women could find a gown they love and best represents their personality. Coincidentally enough, I was also co-sharing a space for my studio with my now-partners for about a year, before I decided to join them and be a part of Grids and Circles. To be more specific, I’m working on the communications and events planning aspects at the moment. It wasn't what I planned out for myself, but I've always wanted to take ownership of things and find that I can somehow value-add in terms of the process and management. Honestly, things weren't 100% smooth all the time, but I think we worked well as a team and lots of things came naturally. So that was that, and now I'm embracing the fact that new doors may open at different points in everyone’s lives. With so many things on your plate, do you feel that people support all your endeavours? Have you ever been judged as a female? K: I think my parents deal with my change with a lot of openness, which I am so thankful for. Honestly though, I don’t find that being a woman has really gotten in the way of things for me - I think I’ve been super lucky to be surrounded by extremely supportive people no matter what I do whether it was starting out on my own or changing my path. Although I must say that some times people tend to undermine what women can really contribute - it’s not always women with the so-called “flaws” of being process-driven or “emotional”, I find this to be true no matter who it is regardless of gender. Some times, it just helps when we focus on the problems and respect that everyone has their ways of communicating these things. We know you are also a mother to your 2 year-old daughter, it must be tough managing everything at one go - how have things been? K: It's not easy I must say - but as most working moms do, I get a lot of support from my family and in-laws, who are wonderful grand parents to my daughter. I wished I could do more, but also know it's important to take a step back when required. I take short trips and breaks, so that I get to take a breather every now and then and come back refreshed. How would you describe your personality in just 3 key words? And also, what best describes your fashion sense? K: Wow I never really gave this a good thought (Kim pauses for quite a bit) - I think I'm definitely more free-spirited as a person, and have a strong and perhaps more spontaneous or should I say daring personality since I'm quite a try-all hahah. And on my fashion sense… I don't exactly have a fixed style - I go with what the day calls for and do pretty much anything that allows me to be comfortable, from shorts to wide-legged trousers and more relaxed fits definitely. And mainly sneakers too, so I can walk around without worrying whether my feet hurts. Although one thing is that I'm a little taller than average so shopping can some times be a little bit of a hit and miss process for me. Do you actually know how to make coffee now? What would you recommend for people to try? I only started trying coffee again because of work, and took the effort to try again and test things out sip by sip. Somehow I started to appreciate coffee more, and learnt a great deal from my staff and partners. I would definitely recommend the Lavender coffee latte, which is quite unique to us! And if you're looking for something light and easy, then go for the Tamago Sando - which also translates to Egg sandwich in Japanese. Could you share a piece of advice with young people who are looking to start their own businesses as well? K: Go in with an open mind, and seek out opportunities, keep doors open and give your 110% no matter. I think the art of learning to compromise is really the key - because a lot of situations and things are about letting go and make improvements. What do you have in mind for your 2019? In terms of self and for Grids and Circles? K: I'm definitely hoping 2019 will allow me focus on introducing new lifestyle concepts and improve upon our offerings. We have a third floor space which I'm looking to convert into a workshop space to support local creatives and the community. Hopefully this will allow me to conduct some workshops related to sewing so I can combine both my areas of work and interest together, after all it's something I first embarked on and would love to continue pursuing. It gives me drive and more inspiration. Lastly, I definitely would love to achieve a better work-life balance so I can make time for things that truly matter, like my family. We thank Kimberly to have taken part in our project. Thank you for reading and supporting us, this is a project and initiative by 3EIGHTH. We are working hard to keep this burning as a permanent project.